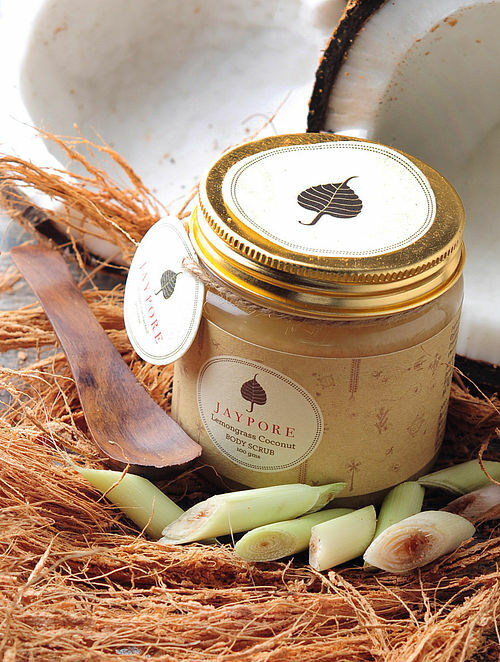 - Uniquely formulated with grated coconut soaked in a blend of nourishing organic vegetable oils, enhanced with pure lemongrass essential oil, our scrub is an aromatherepeutic treat to exfoliate and antioxidize the skin. Use weekly all over the body to nourish the skin and reinvigorate the senses. - Ingredients:- Fractionated Coconut Oil, Salt, Coconut Powder, Organic Safflower Oil, Emulsifying Wax, Organic Lemongrass Oil, Vitamin E.
- Lemongrass is a potent astringent which helps minimize pores, limits the secretion of excess oils and provides a temporary skin-firming treatment. Coconut acts as an exfoliant and nourisher in this product which makes it best suited for ageing skin.